One sure way to see the changes in the season and holidays is the differences we see in the ingredients we use to bake. For example, with fall you may use a lot of apples, cinnamon and pumpkin which is why that is my favorite time of year to bake. The same is true with holidays. When I think of Valentine’s Day I imagine red velvet cake and red fruits such as cherries, raspberries and strawberries and of course chocolate! This makes it very easy to take almost any recipe which incorporates these ingredients and make them fit a Valentine’s Day theme. 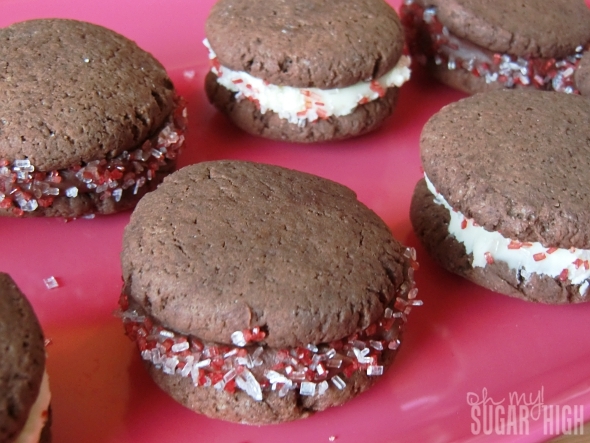 I recently made some chocolate sandwich cookies which were simply a chocolate cookie with a white chocolate ganache filling. 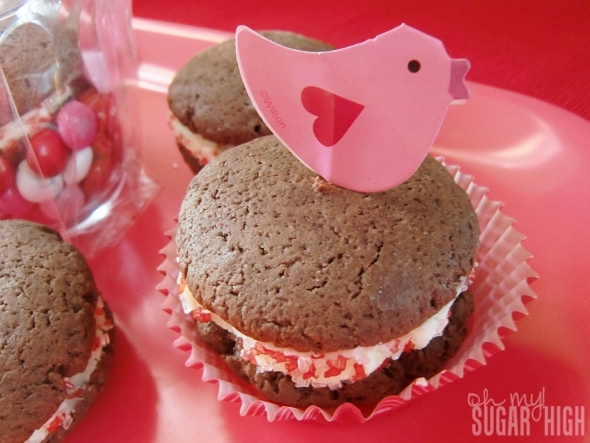 To make them fit the Valentine’s Day theme, I rolled them in red and white sugar which created a very festive sparkle. For adding a bit of wow factor for gift giving and having them on display, I thought outside the box a bit and used cupcake decorations. 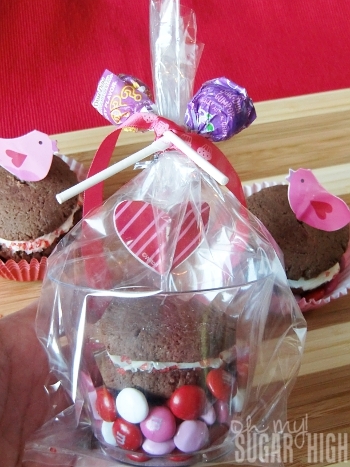 Picks like these give a new dimension for other types of treats besides cupcakes! 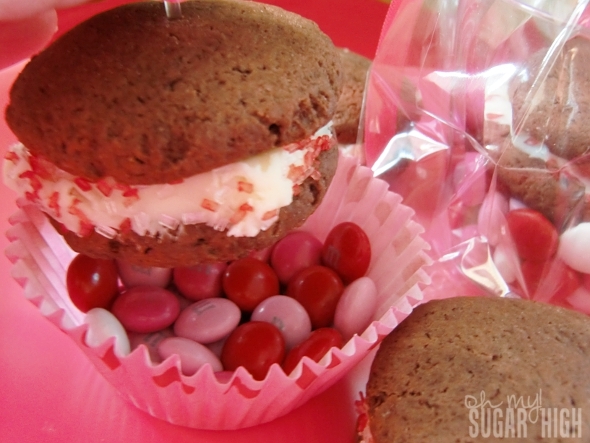 I wanted the sandwich cookies to have some lift and fit above the cupcake liner so you could really see the sparkles on the filling therefor I left a chocolate candy surprise on the bottom of the baking cup. For easy transport you could also incorporate clear plastic drinking cups and layer some treats on the bottom before inserting the cup into a simple plastic party bag and tying with ribbon and even more treats! This is a very inexpensive way to show someone you care. Just imagine all of the possibilities! When thinking about any holiday, don’t limit yourself to recipes which are tailored to a specific time of year. You can make your favorite recipes and add a little twist to incorporate the occasion. 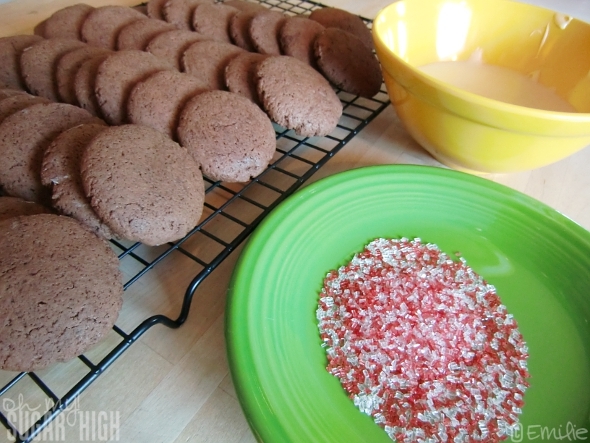 To make these treats and the very popular and quite delicious Chocolate Chunk Banana Bread cookies I shared with you a couple of weeks ago, I used White Lily flour. They were kind enough to send me some samples as I unfortunately can not get this brand in my area. 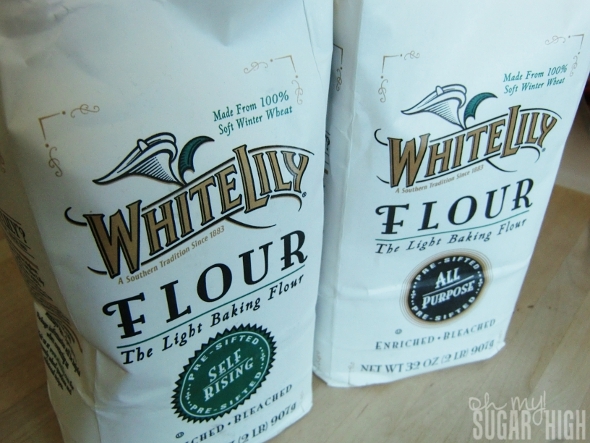 In case you aren’t familiar with the brand, White Lily flour is a top grade flour which is lighter and made from soft red winter wheat as opposed to a combination of soft and hard wheat flour that is found with all-purpose flour. It also goes through more processing so it is is made to be lighter and silky smooth. Just keep in mind that in a typical recipe calling for 1 cup of regular flour, you should add an extra two tablespoons when using a non-White Lily recipe. 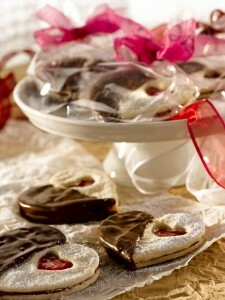 White Lily has some fun recipes including these for Valentine’s Day: Chocolate Covered Cherry-Filled Shortbread Cookies this Red Velvet Valentine’s Cake. Yum! Currently this brand of flour is only available in 16 states. Check out the Where to Buy section of the White Lily website to see if you can locate it near you! White Lily wants to give one of my readers the chance to try out their top grade flour and make their baking for any time of year more enjoyable with this fantastic prize package including a Cuisinart hand mixer in brushed chrome! 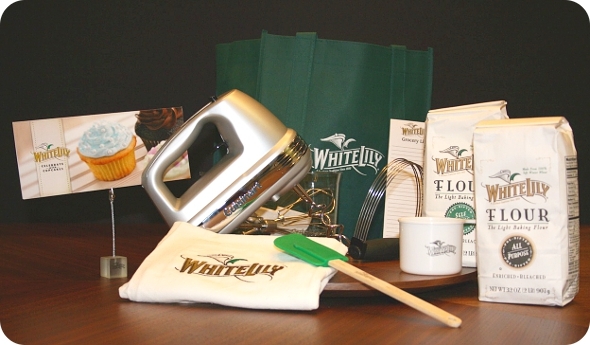 White Lily Baking Prize Package including Cuisinart Power Advantage Plus 7 Speed Hand Mixer in Brushed Chrome, pastry blender, White Lily Flour, White Lily baking tools and promotional items as shown above. Look over the White Lily recipes and tell me one you would love to try! Required entry must be completed before extra entries qualify. Leave an additional comment for the value of each extra entry and a way to verify the entry. When choosing the blog about this giveaway option, your blog post must include an active link to this giveaway and be at least 80 words in length. See Official Rules. US only (no PO Box) Sweepstakes ends 2/28/12 at 11:59pm CST. Winner(s) will be notified by email and listed on the Official Winner’s List. The product(s) featured were provided free of cost to me by the manufacturer or representing PR agency. Opinions expressed are my own and are NOT influenced by monetary compensation. i would love to make the chocolate pecan pie….sounds like a slice of heaven! I’d love to try the Autumn Apple Dumplings. I would love to try the Buttermilk Chicken Tenders! Thanks for the giveaway…we have our eye on the Carrot Spice Muffins recipe. I would like to try the Buttermilk Chicken Tenders. I signed up for the White Lily Newsletter. I like “Oh My, Sugar High” on Facebook. I subscribe to your newsletter and confirmed. I would love to try the Apple Butter Thumbprint Cookies. I love breakfast, so I checked there and found a recipe for a Caramel Pecan Biscuit Bake! I would love to try the Chicken Artichoke Casserole recipe. I like the Oh My! Sugar High Facebook.